An East Midlands recycling business has installed an additional fuel storage tank following the opening of a second processing yard. The new fuelling point has increased capacity, enabling separate fuelling points to be assigned to diesel, for road transport and gas oil for plant machinery. Drivers usually refuel after each shift so that their vehicles are ready for an early start the following day explains the company’s transport manager. By setting up this additional facility, dedicated to the lorries, the company has saved hours of time that was wasted previously, while queuing for fuel. More importantly, drivers can now get home to their families without unnecessary delay. Supplied and installed by Ledbury Welding & Engineering, the new fuelling point comprises a 50K capacity diesel storage tank, equipped with leak detection and electronics contents gauging. An inspection hatch allows access to underground pipework running out to the fuelling island. The layout is designed to use yard space more efficiently since vehicles can draw fuel from either side. 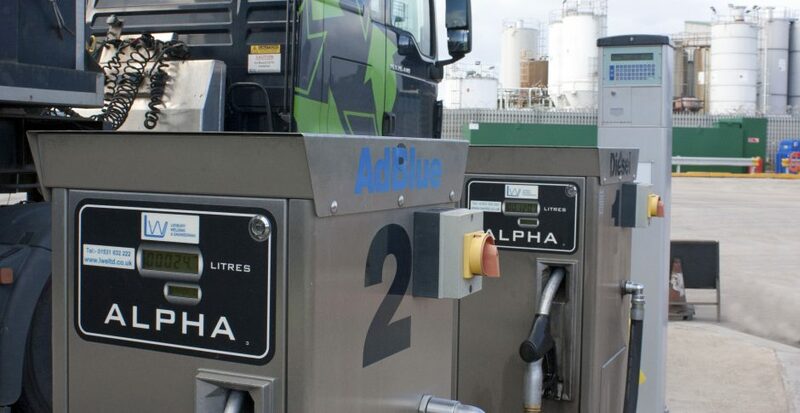 LWE provided a complete fuelling solution including pump dispensers, for diesel and AdBlue and a fuel management control unit, as specified by the client. Access to fuel is controlled by key fobs assigned to specific vehicles or plant machine. Details for each transaction – the amount drawn, time and date – are recorded. The data is collected and presented as a computer dashboard by a web-based reporting system. Usage and current stock levels for all sites are monitored from the HQ transport office.